The Citizen editorial board calls Locate Finger Lakes a Hit! HIT: To an initiative designed to promote the Finger Lakes region. 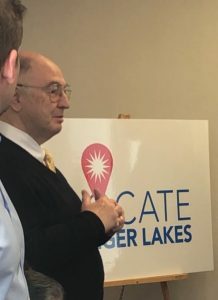 LOCATE Finger Lakes, spearheaded by former state Sen. Michael Nozzolio, is designed to promote economic development in the region. The slogan for its new online resource — locatefingerlakes.com — is: “Where business and the good life meet!” And that says a lot about the purpose behind it. The goal, Nozzolio said, is not to compete with existing economic development initiatives but rather develop partnerships with industries and agencies. Highlighting the business, educational and quality of life aspects of the Finger Lakes region could pay dividends down the road by encouraging more people to build, work and live here.